Can politics in cities and in Corbyn’s Labour Party come together to facilitate potent collectivities through an explicit commitment to radical democracy? Jeremy Gilbert in conversation. 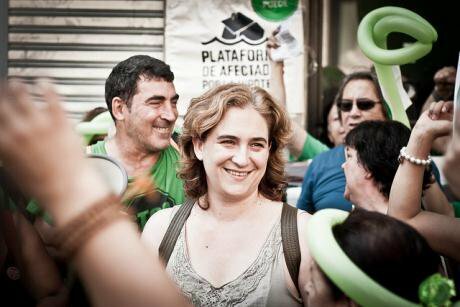 Ada Colau as spokesperson of the PAH, the Spanish movement to stop evictions and campaign for housing rights, two years before becoming Mayor of Barcelona, in 2013. Flickr/ Andrea Ciambra. Some rights reserved. engagée “Radical Cities”(eRC): In the last two decades, western democracies have been witnessing a steady rise of anti-democratic trends and disappointment with politics. Faced with these challenges, contemporary democracies appear vulnerable and unable to defend themselves. At the same time, a radical change is taking place. Movements in cities around the world – through platforms and transnational networks – are experimenting with new forms of democratic practices and political institutions. This reminds us that the radical history of the last two centuries brought about new theoretical toolboxes which activists have used to overturn and change those concepts that undermine key political notions. To what extent do current political movements challenge traditional notions of democracy, power, and social change? Jeremy Gilbert (JG): That’s a good question and arguably it depends on what you mean by ‘traditional notion’. If by this we really mean ‘mainstream liberal-democratic notions’ then obviously, these are being challenged. But in many ways, the demands of these movements, and the basic desires and assumptions informing them are nor particularly new. There isn’t much in the ‘new’ radical municipal politics that the Barcelona anarchists of the 1930s, or the Paris Communards, would not have recognised. Internationalism was always a part of their ideology as well. Even in the UK, we have traditions that have been suppressed for decades but which have roots going back to the 19th century, such as the tradition of the Independent Labour Party (the single most important component of the new federal organisation that became the Labour Party in 1900), that was always committed to ideas such as the democratic management of the economy by workers, and was always hostile to all forms of militarism. The details of the demands and the challenges, the range of power relations under discussion, and the necessary theoretical frameworks continue to evolve, but the basic demands and organisational ideals are the same; partly to the extent that the basic problems and obstacles to real democracy (plutocracy, liberalism, capitalism, patriarchy, nationalism) remain the same. 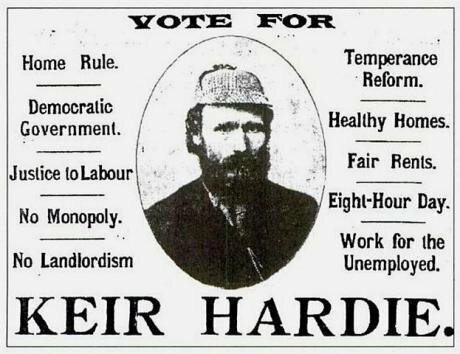 Election poster for Keir Hardie, about 1895. Wikicommons. Public Domain. 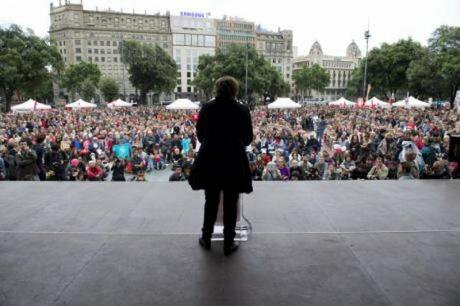 eRC: The new transnational and municipalist networks such as the network of fearless cities, sanctuary cities, and rebel cities seem to respond to the consequences of the 2008 financial crisis, of austerity politics and of European asylum and migration policies. Through alliances, platforms and international networks, they experiment with new forms of democratic practices and political institutions. In which way do these movements lay the foundation for new visions and practices in developing a real democracy? How do they expand or even enhance a radical democracy through their visions and practices? JG: Well, this is a huge question so I can only offer a very sketchy and mainly conceptual answer. Broadly speaking, any form of democracy must enable the emergence, on any scale at all, of what I call ‘potent collectivities’: which is to say any kind of group that is actually capable of making collective decisions and enacting them in some way. This sounds banal – and to some extent it is. But it is also the case that neoliberal society (like all hierarchical societies, to some extent) works very hard to deprive most people of any such experience in any area of their lives. So, to the extent that any of these institutions or movements enable potent collectivities to emerge at all, they have positive effects in promoting the development of democracy. At the same time, I think that these municipalist movements contribute in a particularly important way simply by asserting the status of the city as a key site for democratic energy and invention. It’s no accident that the Left almost always has its bases in the cities. Hardt and Negri say that the metropolis is the home of the multitude, and in this, they have a very important point. One of the key cultural operations of bourgeois and anti-democratic ideology since the late 19th century has been to denigrate the city, to present the city as fearful, as somewhere to escape from, as somewhere that most people should not want to be. In simply making the city a beacon of hope rather than an object of fear, these movements are playing an important role in counteracting that ideology. eRC: What challenges do you think these movements face? What are the potentials and limits of their approaches and what are the obstacles that prevent the full realization of a new and more radical democratic order? JG: The answer here is pretty simple. We don’t live in city-states. Even in the most urbanised country in Europe, the UK, more people live in small-to-medium-sized towns than in large towns and cities. We live in essentially suburban societies. How to scale up and extend practices of radical democracy beyond specific urban locations is a key question. In the age of instant horizontal communication, it ought to be easier to resolve this question than ever before, at least technically and organisationally. Ideologically, culturally and politically, it may be more difficult. A key issue is the fact that the proudly cosmopolitan culture of the cities is often not shared by suburban and rural communities, and those communities can often feel that the cities are imposing their culture on them – a real challenge is to find ways to make that culture feel welcoming, accessible and attractive to those outside the urban centres, and to bring forms of democratic politics into those places that can make people there feel able to participate in them and in decision-making over the nature of their own localities. eRC: Radical democracy is a heterogeneous field. How do you use this term in your work? And which concrete examples do you refer to? JG: I use the term to refer to politics or practices that seek to facilitate or enable the emergence of potent collectivities, and that understand the potency of those collectivities always to be at least partly dependent on their capacity to express their constitutive complexity and multiplicity. This is different from how some others use the term partly because I think my use of it implies a positive conception of democracy rather than a merely negative one – i.e., that would only really talk about what democracy is not, or how it institutionalises the absence of sovereignty, rather than what it is and what it positively enables. In terms of concrete examples, this just depends on what is current at the time I am speaking or writing, but right now, the attempts by Barcelona en Comu to institutionalise forms of participatory democracy in their city must stand as a key example in practice, as well as some of the experiments in constituent assemblies that have taken place in places like Bolivia. In an article that you wrote for The Guardian on which Corbynism we need, you distinguished between two terms: “Radical Democracy” and “Retro Social-Democracy”. Can you elaborate on the core characteristics of the division between radical decentralisation and centralising social democracy? JG: From the early 1960s onwards, at the latest, there is quite a widespread critique being made of the institutions of the post-war welfare states in Europe and the New Deal institutions in the US, the nationalised industries of those countries, and the Fordist enterprises that dominated the corporate world. That critique focused on their tendencies to paternalism, technocracy and hierarchy, on the fact that they left certain social relations fundamentally unchanged by never challenging the worker-boss-relationship and by having a mode of public service in which experts did things to or for service users, but did not enable most citizens or workers to participate in decision-making about their workplaces or the services that they relied on. The idea of radical democracy partly comes out of that moment of critique and the movements that it resonated with – such as the women’s movement, which was always sympathetic to the argument that the welfare state was organised in a patriarchal way, assuming women’s subordination to men. The objective of any such politics now must be to overcome the centralised and hierarchical nature of such institutions in order to democratise them. I am very happy to say that at the present time, the Labour Party leadership in the UK is moving strongly in the direction of advocating forms of collective ownership of businesses and services that are distributed, democratic and co-operative in nature rather than being centralised, technocratic, bureaucratic or paternalistic. They have recently promoted a ground-breaking document on ‘Alternative Models of Ownership’, as well as calling a national conference to discuss it, which is quite inspirational in its vision. In the present historical context, I’m always wary of the term ‘decentralisation’. This tends to imply that central governments have accumulated power that they will be able to disperse if they are occupied by progressive forces. At least in places like the UK and the US, the situation is far more intractable than that. Governments have not taken power away from localities and accrued it to themselves. They have colluded in breaking down local sources of collective power and handing power to private agencies: outsourcing firms, international corporations, huge accountancy firms, etc. In many cases, these agencies are too large and too powerful for municipal authorities to challenge fully, however strong a popular base they may have. In such cases, we will need national governments, and even, ideally, sympathetic supra-national institutions, that are committed to weakening those powerful agencies and building up local sites of collective power. 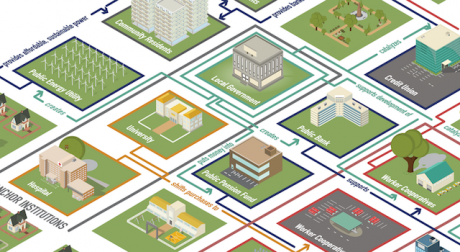 To the extent that this must be done in a way which enables multiple and distributed sites of collective power to develop (city councils, democratic schools, co-operatives of many kinds, autonomous media institutions, etc. ), then we can speak of ‘decentralised’ power. But it is important to understand that this will not simply be a matter of power being dispersed by central government. Central government does not currently possess that power. Local and democratic power will have to be constituted from the ground-up; although the role of central government in assisting this process will be indispensable. eRC: In their latest book, Assembly, Hardt and Negri argue that leaderless movements are not able to offer the solutions we are looking for. Would you say that we need something more than pure horizontality? And if so, what exactly do we need? JG: Of course, we need more than pure horizontality to the extent that there can be no such thing as pure horizontality – any set of social relations or form of social organisation will have at least a minimally ‘vertical’ dimension. This is why forms of anarchism that attempt to implement pure horizontalities inevitably descend into libertarian, individualist nihilism. This is why I think that all of those theories of radical democracy that are primarily concerned with the ‘vertical’ dimension, with questions of sovereignty etc., most notably the theory of Chantal Mouffe, remain immensely valuable and important. It is necessary to recognise the indispensability of this vertical dimension – and to work to institutionalise pluralism and non-finality within it, by ensuring that those representative and governmental structures that all organisations need are as open and accountable as possible to those they purport to represent – even while continuing to attend to the primary and constitutive nature of ‘horizontal’ relations. At the same time, in that book, Hardt & Negri are addressing a crucial set of questions – the questions of strategy and leadership. They make, I think, an excellent suggestion: that we certainly need political strategy in these movements. Thankfully we are now a long way from the period of the ‘alterglobalisation’ movement when many anarchists regarded the mere use of the word ‘strategy’ as some kind of Stalinist heresy. We even need leadership at times, but we should reverse the traditional vanguardist conceptions in order to promote an ideal of collective strategy and tactical leadership. According to this conception, the role of leadership is not to determine overall strategic objectives and the means of achieving them, but to manage short-term situations and problems, to act tactically, in line with strategic objectives and methods determined and agreed-upon by the whole movement. This is an excellent model and I believe that to some extent, in a situation like the contemporary Labour Party, we are seeing some positive moves towards such a conception of leadership and collective politics. eRC: In your experience as a theorist and an activist, how can we bridge the gap between radical democratic theory and practices? JG: There’s no way of answering that question in a general way – it always depends on the context and the specific situation. I can make some observations but they amount to little more than banal truisms. Firstly – it’s always necessary to allow practice and experience to inform theory. The difference between theory and philosophy is that theory is a set of generalisations based on experience and experimentation. Secondly, it’s often difficult to persuade people (organisational comrades, local communities or political constituencies, trade unionists, whoever) that radical democratic objectives are necessary or desirable, or are more than pleasant diversions from the ‘real’ business of protecting their material interests. I think it’s almost always crucial to make the case for radical democratic practices and demands by emphasizing how necessary they are to the realisation of many basic material objectives. We don’t just want radical democracy because it’s ethically or aesthetically desirable. We want it because history has shown time and again that social reforms or economic gains will only ever prove temporary unless they have a radical democratic dimension, enabling their main beneficiaries to have genuine democratic control over their administration. We have also seen many times that the erosion of such democratic control is a precursor to the final reversal of those gains – for example when local democratic control of services is weakened, privatisation is rarely far behind. eRC: The self-description of being a radical democrat seems to be missing, especially when we think about being a socialist or a communist. What are the reasons behind this and why would you, or would not, call yourself a radical democrat? JG: That’s a good question. I was thinking about this question just the other day. I think one reason for this is that most radical democratic theory is inherently suspicious of all forms of identity politics, and would implicitly recognise even political self-designations of that nature as often operating according to an identitarian logic that is ultimately unhelpful to the realisation of progressive objectives. In my own case, it is true that I have often described myself as a ‘radical democrat’ but in recent years I’ve been more reluctant to do so. This is partly because people simply don’t understand what it means, but partly also because of my perception that a great deal of self-designated radical democratic theory and philosophy in recent years has essentially amounted to nothing more than a kind of post-structuralist liberalism. To a large extent, I remain inspired by the classic founding text of post-Marxist radical democratic theory: Laclau & Mouffe’s Hegemony and Socialist Strategy. For me, radical democracy must be a form of socialism, just as socialism must be a form of radical democracy, or else they are not worth much. At the moment, I’m happy enough just to call myself a ‘socialist’. Of course, this is largely because we are presently at a moment when, for the first time since the 1940s, the dominant form of socialism in Britain is one that is explicitly committed to certain kinds of radical democracy. eRC: To what extent does the success of Corbyn in the UK represent a success story for radical democrats? JG: It certainly does represent such a success story, but radical democratic ideas are still only really embryonic and implicit in the programme and practice of much of the pro-Corbyn movement within the Labour Party. It’s a strange situation. The leadership of the party is clearly committed to such an agenda, while many of their followers would be content to see the restoration of post-war top-down social democratic models. There is very little campaigning on democratic issues as such, and the interest in co-operative models and workers’ self-management is largely coming from the top of the party and networks of intellectuals close to it, rather than from the grassroots. The June 2017 party manifesto has become an almost religious touchstone for Corbynites, but most of its proposals were really informed by a statist, centralising social-democratic set of assumptions. 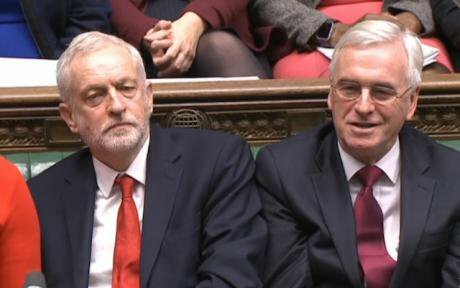 Labour party leader Jeremy Corbyn and Shadow Chancellor John McDonnell, November 2017. PA/Press Association. All rights reserved.The extraordinary thing here is that it is the leadership itself (Corbyn, the Shadow Chancellor John McDonnell, and their closest advisors) who have been actively encouraging criticism of the manifesto from a radical democratic and libertarian socialist perspective, apparently seeing the manifesto itself as a limited compromise with traditionalist elements in the party that they would like to go beyond. But it remains to be seen whether we can convince the broader ‘mass’ of Corbyn-supporters that explicitly radical democratic demands must be a part of their agenda, rather than that being entirely dominated by an opposition to ‘austerity’, an opposition that in itself has not necessarily a democratic dimension. The fantasy of a benign Corbyn-led government simply reversing austerity and restoring the generous, paternalistic, social-democratic state to its former glory remains a strong one with much of the Labour membership, I’m afraid. But it is very encouraging that the leadership itself is keen to overcome it. eRC: Looking at how the Labour Party intervened to stop the action of some of its councils in implementing urban development plans opposed by local communities, do you see a potential municipal turn of the Labour Party in such actions? JG: Labour has already had a very proud history of what is called ‘municipal socialism.’ The most famous example is the period during which the Bennite Left, under the leadership of Ken Livingstone, ran the Greater London Council in the early 1980s. Radical democratic ideas were already a direct influence on many of their policies, including the democratisation of cultural policy, the empowerment of women and minorities, the promotion of innovative forms of co-operative enterprise, etc. 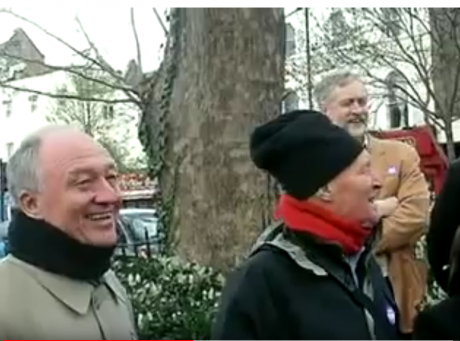 Screenshot: Ken Livingston campaigning for London Mayor, with anti-war activists Tony Benn and Jeremy Corbyn in Islington in 2008. YouTube.This programme was popular, and the entire GLC was abolished by Thatcher in 1985 because the Tories couldn’t beat the Labour left politically in London. Right now, the Corbynite city council of Preston is being seen as the beacon and exemplar for radical municipalities to follow, pursuing a bold regeneration plan through the development of collective resources and high levels of popular participation. So, it is not a question of any such radical municipalism being ‘potential’; it is part of our heritage and its revival is well under way. eRC: In a recent article called “Acid Corbynism,” you argue that “technologies of the self” such as yoga or clubbing can raise political consciousness if collectivised. Should such instances be part of a new strategy for urban movements? JG: Again, this all depends on the context. Where opportunities present themselves for such practices to be radicalised or to become vehicles of radicalisation, then those opportunities should be taken. But I think the issue is as much about trying to ensure that such technologies do not become wholly captured by neoliberal culture in the way that certain kinds of yoga and meditation practice clearly have been, as it is about finding ways to positively use them to our advantage – which might or might not be possible in different cases. As for dance music culture: again, I can only really speak with authority about the British context here. There certainly was a moment around 1993/4 when the burgeoning rave culture was widely perceived as constituting a form of popular resistance to both bourgeois individualism and patriarchal norms. The leadership of the Labour Party and broader labour movement had no interest whatsoever in collaborating positively with it however, and were more than happy to collude with the Tory government in suppressing it; or rather, suppressing those forms of it that could not be easily disciplined by the logic of commercialisation and capital accumulation – once those radical forms had been neutralised, governments were happy to tolerate the growth of a depoliticised commercial club scene. Now that we have a radical leadership that is genuinely open-minded about a whole range of social, political and cultural issues, there is finally a reason at least to start discussing the question of how far such cultural technologies and practices might be deployed for emancipatory purposes. Whether this applies in other national contexts, I can’t really say. But I would say that to some extent, the capture of the leadership of the institutional Left by the radical Left has been a necessary precondition for making those conversations possible at all. engagée will soon hold two release events to launch its latest international double issue on “Radical Cities”: 28 September 2018 in Rome at ESC and 30 October 2018 in London at Goldsmiths University.